Hurricane Irma raged into the Caribbean this week as a Category 5 storm, taking at least nine lives so far, leaving a million Puerto Ricans without electricity, and reducing the island of Barbuda to rubble. And it's not done yet; the storm is expected to strike Florida in a few days. 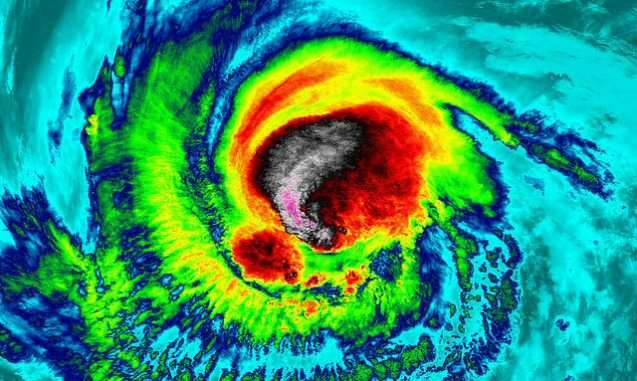 With winds reaching 185 miles per hour, Irma is the strongest storm that's ever been recorded outside the Caribbean and Gulf of Mexico, and it came awfully close to matching the fastest-ever hurricane speeds of 190 mph. Irma maintained those 185-mph winds for two days straight, a record-breaking length of time for an Atlantic storm, fueled by the water's warmer-than-usual temperatures. Those stats caused some meteorologists to wonder whether Irma should be in an entirely new category of storm. Meteorologists tend to rank hurricanes by their wind speeds. They use the Saffir-Simpson scale, and it sorts tropical cyclones into categories 1 through 5, with 5 being the most dangerous. A Category 1 storm, for example, has winds between 74 and 95 miles per hour and will cause some damage. At the other end of the scale, Category 5 includes any storm with wind speeds over 156 miles per hour—storms that can cause cataclysmic damage. Category 5 covers a much broader range than the others, and some hurricane experts have pointed out that if it were broken up in the same method as the others, then Irma would be considered a Category 6. 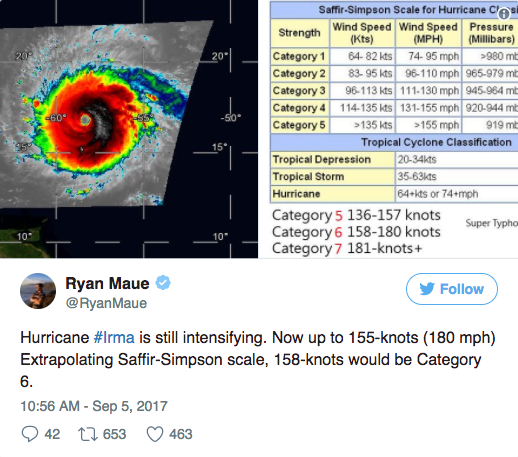 Some media outlets (and/or hoaxes) mistakenly reported that Irma was classified as a Category 6 hurricane. No such category currently exists. But with the climate changing, warmer oceans are predicted to funnel extra energy into storms, causing a higher proportion of stronger hurricanes. "One could make a case that Irma, and many other historical storms around the globe, could have been designated as Category 6," says Radley Horton, a climate scientist at Columbia's Lamont-Doherty Earth Observatory. The argument for a Category 6 is bolstered, he says, by the fact that higher wind speeds can cause disproportionately more damage. So, for example, the difference in potential wind damage between a 190-mph 'Category 6' hurricane versus a 156-mph Category 5 would be much greater than the difference between a 111-mph Category 3 and a 74-mph Category 1. However, since the 156-mph winds have the potential to totally devastate an area, would it really be meaningful to add a category beyond that? Suzana Camargo, who studies hurricanes at Lamont-Doherty, doesn't think a Category 6 designation would be helpful, and she's not alone. "While storms with the category of Irma are rare in the Atlantic, they're not as rare in the western North Pacific and the Saffir-Simpson scale works well there," she says. But as the world warms, the upper limits on a hurricane's potential intensity are expected to rise, which might justify adding more categories to the scale in the future, suggests Timothy Hall, who models hurricane risk at the NASA Goddard Institute for Space Studies. "In the future, there may be storms that are more intense than anything we've seen before, because the roof of intensity is higher. If those really intense storms get more frequent, it might be convenient to develop a new distinction between the very destructive versus extremely destructive storms." Although most predictions suggest that climate change will bring us more strong storms like Irma in the future, "it is not a sure thing," cautions Horton. Storms this powerful are rare enough that scientists don't what is a "normal" number of storms of this strength. Historical records only go back so far, and equipment that measures the intensity of a hurricane is relatively new, so it's difficult for scientists to find a trend in the limited data. So while scientists expect that warming of the sea surfaces will make hurricanes more intense, says Horton, it's also possible that other factors, such as changes to wind conditions in the atmosphere, could end up reducing severe hurricanes. Meteorologists have discussed adding a new category to the scale in the past, but for the foreseeable future, they'll have to continue making-do with the current scale of 1 to 5. And scientists who study weather and climate are used to dealing with imperfect measures for a storm's hazards; the Saffir-Simpson scale only measures wind speeds, which are not the only source of danger from a hurricane. Hurricane Harvey was only a Category 3 hurricane, but last week it flooded Texas with a devastating amount of rainfall, causing some of the worst storm-related damages in history. "Emphasis on wind speed, while important, risks obscuring an even more important point," says Horton. Wind speed is easy to measure and predict, but storm surge—a rise in ocean water around the hurricane—is one of the most dangerous aspects of a tropical cyclone, and it can't be predicted from wind speed alone. It depends on how large the storm is, the shape of the coastline, and the topography of the sea floor. "While simple indicators—such as wind speed—can have enormous value, they cannot fully define local risk," says Horton. "This fact is an argument for a more complex and nuanced way of measuring a hurricane's danger." We have hit category five in early September and peak hurricane season is in October. However, since the 156-mph winds have the potential to totally devastate an area, would it really be meaningful to add a category beyond that? @anti, I'd say that from the point of view of someone on the ground, whether their house can be repaired or must be raized to the ground and reconstructed is pretty important. It will also be important for insurance purposes since the cost is somewhat different. I could make some pretty sarcastic comments regarding the difference, but I think you're already making the difference clear. Maybe you've never dealt with a major loss with an insurance company before. If you are in a building rated for category 5; and a category '7' comes along; you know you need to move before it hits. Also with modern meteorology there would be analytical and public benefit to a hurricane scale having a decimal place and being discussed as say a 5.3 and expected to rise to around 6.2 by tomorrow. Forecasting science would keep advancing to make the numbers more accurate and useful. If you got a plan for a house that will handle a 150 mph hurricane it will probably look like a blockhouse in Nevada next to a nuclear weapon test site. I am reminded of one of the Douglas Adams books in which he describes the band "Disaster Area." The best site for watching one of their concerts is said to be a blockhouse about 2 miles from ground zero. Snicker. These apologists for Trump who are more interested in keeping their jobs than saving lives or protecting the public have GOT to be replaced. This will happen as voters finally realize that soft soap and head in the sand cost lives.....and vote out permanently or even jail those that willfully put them in danger just to 'keep the tourist dollars flowing. Hard to blame Trump for hurricanes, no matter how big a fool he is. Now, sending $15 billion to a $150 billion problem, that we can blame him for. With another one coming right behind. Then again, if he can't get the Republicans to work with him he appears to be able to get what we need from the Democrats. $15 billion is better than a poke in the eye with a sharp stick which was about what the Reps were going to send. So we'll see how that works out. I managed to, quite entertainingly, stand up in a 70mph wind: Leaning at a 30 degree angle. With sensible design 150mph for engineering materials is very doable: If you don't leave any big trees near the structure. The question could be being asked against an inappropriate background. The nature of an atmosphere composed of whatever admixture of oxygen, nitrogen, water vapor, carbon dioxide and whatever other substances as is currently accepted. It fails to accept other substances and the way they behave, deposited by chemtrails. Among other things, the chemical likely has a high thermal inertia, changing very slightly in temperature even while absorbing a great amount of heat. When it rises into the atmosphere, it releases the greater heat and that gives rise to more powerful storms. It might be asked why no one notices the chemical and it could be that it is a form of water not usually seen. Phys Org itself said a form of water had been found that remained liquid even under conditions of extreme cold, indicating it holds heat more. @EyeN, you forgot that wind force is the square of velocity. My past wide-ranging researches have also involved study/comprehension of vortex dynamics (in a range of mediums/contexts). One particularly interesting observation was the "CLUSTER" and "MELDING" behavior of two/more vortices if generated at a certain proximity distance to each other. The clustering/melding depended on whether sufficient energy-input was sustained into the composite system under study, which overcame the tendency to mutual counteraction or mutual repulsion between said vortices. If sufficient material/energy present in the system, vortices would be sustained long enough to engage in clustering/melding because any transition/interaction 'losses/destabilizing' of peripheral 'flow lanes' would be immediately 'repaired' and the vortices continue cluster/meld behavior. This can be observed in Jupiter's vortices dynamics/growth/declines etc. Hence: AGW related increase in heat/energy in ocean/land may produce new/more Hurricane 'clusters' and 'meld monsters'. And yet they haven't risen even as the earth has warmed approximately 1° C since the early 1900s. Yeah, I know, it's not a lot of warming, but that's what all the panic is about. The Labor Day hurricane of 1935 was the strongest until Gilbert in 1988, then Wilma in 2005. Irma isn't the strongest, but it's up there. So far there is no measurable trend of increasing hurricane intensity despite already measurable warming. Which was basically my question: are buildings "hurricane rated" at all? Or is the category just used as a trigger for authorities to have entire regions evacuated? If cat 5 already means "get out" then having a category 6 can't add any more actions to be taken.